After 12 months of operation, London’s bikesharing outfit Barclays Cycle Hire boasts roughly 6 million logged bike trips.Photo by Donald Macleod. 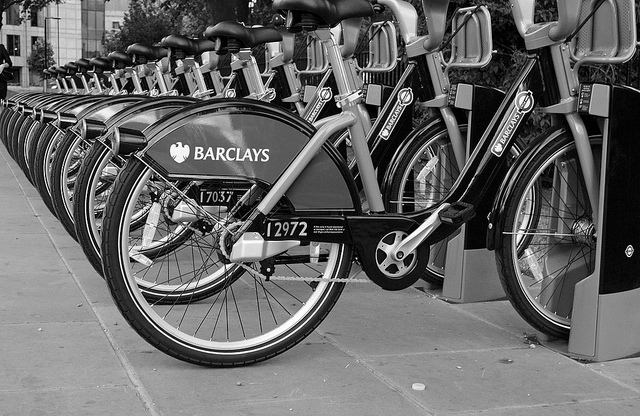 After 12 months of operation, London’s bikesharing outfit Barclays Cycle Hire boasts roughly 6 million logged bike trips. Car2Go, the flexible carsharing service, is looking to expand to Washington, D.C. with 300 cars as soon as this fall. Car2Go is already operating in Austin, Vancouver, and Hamburg and Ulm. The U.S. Senate Environment and Public Works Committee released a transportation bill outline, which appears to lack any funding dedicated to bicycling and pedestrian projects. The New York City Department of Transportation launched an information gathering and response system to curb traffic congestion in Midtown Manhattan. Global grid energy storage spending will reach more than $22 billion over the next 10 years, according to a new report from Pike Research. Walk Score reached the milestone of more than 10,000 real estate websites featuring its online resources. Walk Score supports real estate providers by illustrating the location, nearby amenities and “walkability score” of real estate properties. New survey results reveal that Zipcar has resulted in decreased driving and increased public transportation use, plus increased exercise and improved quality of life for its members in Baltimore, Md. In the wake of Japan’s devastating earthquake, Panasonic, Japan’s largest appliance producer, is shutting down 20 percent of its factory facilities and converting the land into “smart towns,” which will reportedly feature solar panels, energy-efficient refrigerators and rechargeable batteries. Toyota unveiled M2LFh (mesoporous two-line ferrihydrite), a material for use in cars with the capability of removing 95 percent of ozone from the air. Fifty all-electric Nissan LEAFs were added to New York City’s fleet of police vehicles as part of Mayor Michael Bloomberg’s PlaNYC initiative. In São Paulo, 160 city buses will now run on renewable diesel fuel derived from sugarcane. California extended its clean vehicle purchasing incentive program for a third year. The $40 million program was approved by the California Air Resources Board (ARB) and includes providing consumer rebates of up to $2,500 toward the purchase of zero-emission or plug-in hybrid vehicles. Chicago embraced its first public electric vehicle charging stations, as 350Green, the company commissioned to produce the stations, completed six of the 73 stations planned for the city. New York City Mayor Michael Bloomberg donated $50 million to the Sierra Club’s Beyond Coal Campaign, a project aimed at ending coal power production and transitioning to clean energy sources. Canada’s national road safety week proceeded last week, with police charging roughly 15,500 Toronto motorists with various offenses. Serious crimes in the Washington, D.C. metro system are down by more than a third, reported Metro General Manager Richard Sarles. New York City MTA officials announced that 464 buses will receive improved bus shields by the year’s end, as a response to bus driver safety concerns. The Santa Clara Valley Transportation Authority launched the first on-train all-4G WiFi network. “As the transit provider of Silicon Valley, it is most appropriate that VTA be the first in providing our passengers with the best, high-speed WiFi technology on the market at absolutely no charge,” board chair Margaret Abe-Koga said. Washington, D.C.’s Washington Metropolitan Area Transit Authority (WMATA) expanded its public communications efforts by hiring a social media manager. To showcase Copenhagen’s bicycle culture, Copenhagenize Consulting, in association with the Danish Foreign Ministry’s Public Diplomacy Office, created a photo exhibition called Monumental Motion to travel the world. Volvo India is accepting nominations for its inaugural “Volvo Sustainable Mobility” award. The objective of the award is to highlight and support sustainable urban transport initiatives. Tags: Asia, Austin, bicycle culture, Brazil, buses, Canada, car-sharing, cars, Chicago, clean vehicles, coal, congestion, Copenhagen, cycling, diesel, electricity grid, energy efficiency, Europe, Germany, Hamburg, India, Japan, London, metro crimes, Mike Bloomberg, Netherlands, New York City, Nissan LEAF, North America, pedestrians, real estate, renewable energy, road safety, Santa Clara, São Paulo, social media, solar energy, South America, sustainability, TheCityFix Picks, Toronto, transportation legislature, U.S. Senate, Ulm, United States, Vancouver, walkability, Washington, D.C.